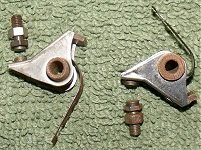 C/w spring and adjustment nuts. 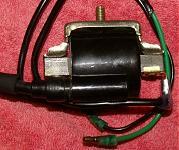 As fitted to C50/C70/C90 and other types of light motor cycles. Also compatible with other makes. Lucas pattern U39 type motorcycle lighting switch Off/L/H, long lever knob. To fit 1-11/16" (1.687") socket hole—£15 each. Lucas pattern U39 type motorcycle lighting switch Off/L/H, short lever knob. To fit 1-11/16" (1.687") socket hole—£15 each. Miniature lighting switch, pull on/push off—£3 each. 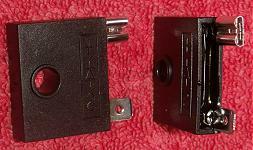 2 × screw contacts for wire connection. Fits into 8mm (5/16") hole. Knob unscrews from spindle for fitting. German made. Neat, simple, reliable, and quality materials. 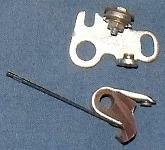 Toggle switch, 2-position, off/on. Fits into 11mm / 7/16" hole—£3 each. Wipac pattern Tricon switch. Fits around 7/8" diameter handlebar, c/w fully wired connection lead. Switching beam/dip, horn & cutout—£15. 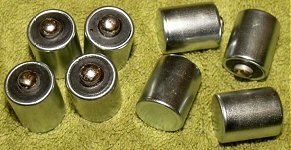 Bosch pattern capacitor (18mm diameter), screw terminal—£6 each. Bosch capacitor (18mm diameter), solder contact—£7 each. Honda C50, C70, SS50 etc. & Yamaha FS1E. Note: We’re recommending this capacitor as a direct replacement for the capacitors fitted to Novi magsets on Mobylette, Raleigh, etc. Clip the connection lead with its terminal from your old Novi capacitor, and solder the lead to the contact connection on this capacitor, then fix this capacitor by the single lower screw hole, and run the flying lead across by the same route to the screw connection on the contact points. These Daiichi capacitors have a far better electrical performance than the original Novi capacitors. Capacitor (with connector lead)—£6 each. Honda C90, C90ZZ, etc. Suitable for typical replacement on PC50, Novio, etc, & general external mounting. Capacitor (without lead) 15mm diameter × 28mm long—£7 each. Kawasaki KH100, KH125, Suzuki AP50, TS100. Note: We’re recommending this capacitor as a direct replacement for Excelsior autocycle capacitor in Wipac 15-72 mag-sets. It pretty much goes straight in (you do need to dress the hole in the backplate out slightly) and just solder the contact lead on. We’re also recommending this capacitor as a compatible fit to Miller magset types W7 & BS9 as typically fitted to Trojan Mini-Motor, Hercules Her-Cu-Motor, BSA Winged Wheel (some models), and other applications, etc. You may want to put a washer under the mounting bracket just to make it sit square on the backplate, but just one screw into the backplate and solder on the lead. 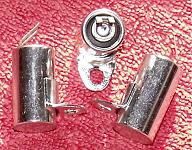 Capacitor (without lead) 17mm diameter × 23mm long—£6 each. Suzuki TS50, TS100, GP100, etc. We’re also recommending this capacitor as a compatible fit to Miller type FW17 magsets as fitted to Phillips Motorised Cycle models, Phillips Panda Mk1/Mk2, Phillips Gadabout P39/P50. The capacitor diameter and position of the mounting bracket are correct to suit location in the mag backplate. 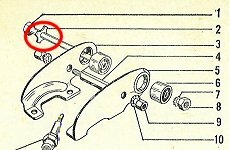 You’ll need to ‘adjust’ the existing hole position to get the mounting screw hole to line up, or drill another hole in a suitable place in the mounting bracket. 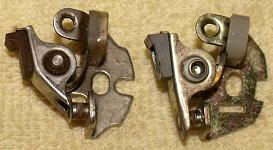 You’ll also probably need to cut some excess material off the bracket (like the clip prongs). New Villiers pattern capacitor—£9 each. 6V AC ‘high-energy’ HT coil with single 6mm stud mounting. £15 each. Typically for Honda moped type applications: PC50, P50, C50/70/90, Novio, etc. C/w fitted copper-core HT lead × 21" long with 16" rubber ‘anti-chafe’ sleeve. 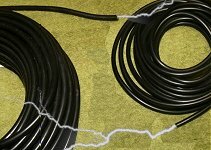 Fitted wires with 5mm diameter bullet connectors to coil and earth lead. Note: requirement for external mounting capacitor in some applications would need the capacitor to be seperately connected. Spade terminal connection. External 32mm mounting for fixing by 2 × 5mm screws. Compatible with Mobylette/Motobécane/Raleigh and other mopeds. Bosch pattern HT coil, 54mm fixing centres, £15 each. Mobylette Novi magset backplate - Lighting Coil Contact Terminal Kits. Novi Lighting Coil Contact Terminal Kit (screw fitting) - £4. 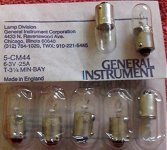 Early type Novi Lighting Coil Contact Terminal Kit (rivet fitting) - £4. 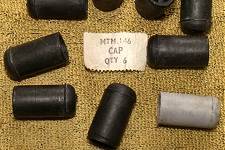 Rubber insulating cap for Novi HT coil - £2 each. 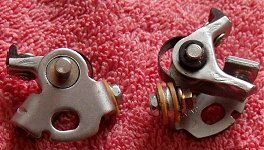 Fits early type Novi HT coils as fitted to Mobylette and Raleigh through the 1960s. Raleigh ref MTM 146. Short 42mm for 4F, 6F, etc. - £25. Medium 50mm for 1F, 2F, etc. - £25. Long 61.5mm for Junior, Junior de Luxe - Not Available. 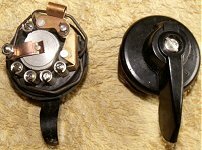 Wipac S1233 pattern HT coil for Scott Cyc-Auto autocycles & BSA Bantam D1-D7, etc, £25. Bosch pattern contact points set / screw terminal—£7 per set. Bosch pattern contacts for small 100mm Mag flywheel set—£8.50p. As fitted to NVT Easy Rider models, Morini Franco engines, Flandria, Garelli horizontal engine, KTM Hobby etc. We’ve been trying to secure replacement contacts to match the Bosch 100mm mag-system for some time, and finally now have something available. 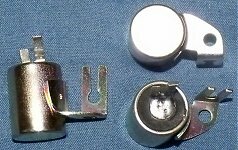 Original Bosch points could come in flying lead, or screw contact forms, but these compatible patterns are only available with fitted flying lead for connection at the capacitor (solder, or fit a terminal for screw contact). 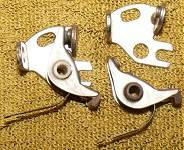 Dansi MDP16 Series-2 contact point set—£12. Fit SIBA MZLF 3/6/18L. JLO FP50 1953–55, Kreidler 1954–55, Victoria Vicky 3 1954–57, Zündapp 1955–59. Fit Stefa magsets 28185 & 28119. For HMW models 1957–59. 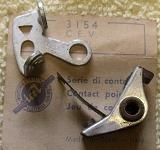 Ducati, etc: Contact points 477 for Dansi Magset—£12 per set. Fit: Ducati, Garelli, Guilietta, Lambretta, Mosquito, MiVal. Ducati Cucciolo pattern contact set—£18. Also fits Ducati 65 & 98 models. For CEV magset. Alpinio 48cc, Typhoon. Impianto Filso 100–101. Ceccato 48cc, Motom 48cc, Lambretta 150 FD–LD Furgona, Motom 160cc Delfino, Pirotino 49cc, Polenghi 48cc. HMW, etc, Contact points . New stock now available—£15 per set. Fit: A.S.O. 1950–54, Avada HMW 1952–54, Berini 1953–54, Cavaletta, Clays, Fuchs, Gasqui, HMW, Locomotief HMW, Monark, N.V., Ranger. 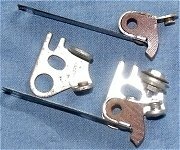 Honda C100 contact point set—£15. Honda: Contact points 30204-333-004L. £10 per set. Marked for: Honda CB350F/F1 (4-cyl) 1972-74, CB400F (4-cyl) 1975-77. Honda: Contact points D-36. £10 per set. Marked for: Honda CD125, CL125, CD175, CL175, CS175. Honda: Contact points D-37. SOLD OUT. Awaiting new stock. Marked for: Honda NC50 Express, P50, PC50, PF50. 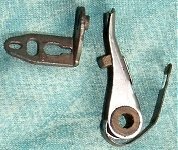 Honda/Kawasaki: Contact points D-48L. £10 per set. Marked for: Honda CB350 (2-cyl) 1968-73, CB360 (2-cyl) 1974-77. FEW ref. 30204-286-004 & 30204-369-154. 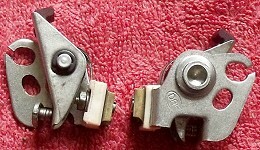 Honda/Kawasaki: Contact points D-48R. £10 per set. FEW ref. 30203-286-004 & 30203-369-154. Honda: Contact points D-92. £7 per set. Honda: Contact points K-45L. £10 per set. Marked for: Honda CB450, CL450, CB500T, GL1000 Goldwing (1975-79). FEW ref: 30204-283-003 & 30204-292-003. Honda: Contact points K-45R. £10 per set. FEW ref: 30203-283-003 & 30203-292-003. Honda: Contact points K-83RT. £10 per set. New Stock: Contact sets for Jlo engines. Contact points to fit Noris magsets ULZ115/1Z - ULZ315/12 — £15 per set. Kawasaki: Contact points D-75L. £10 per set. Marked for: Kawasaki KZ400 A1/A2 (1977-78), KZ400/D/D3/D4 (1974-77), KZ400S/S2/S3 (1975-77), KZ750B1/B2 (1976-77). Miller contact points for BS9 type magset—£20 per set. Note: both LH & RH types. Please make sure the type you’re ordering are correctly handed to suit your application. 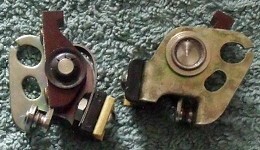 LH type on left side of picture, RH type on right side of picture. RH type typically fits Hercules Her-cu-motor, Early Trojan Mini-Motor. RH maybe also BSA Winged Wheel? Cymota? HEC Powerbike? We’ll try and list up other handed applications as we manage to confirm them. Mobylette antique style contact set with adjustable contact. 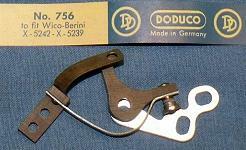 Doduco no.758 / EB Bremi NV1801—£10 per set. Mobylette old style contact set with pivot post fixed in backplate. Schier Ref: 2713,—£10 per set. Mobylette new type 778 contact sets for Relay-box models with anti-clockwise running—£8.50p per set. Both Novi (gold) & Doduco (silver) makes. 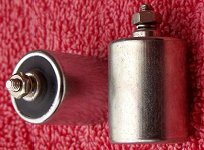 Fits: Mobylette roller-drive BG & BG43, AV92, SP93, SP94TT, AV98, & Sommet models, etc. 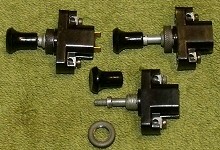 Mobylette type 790 contact sets for Cady engined models—£8.50p per set. Both Novi (gold) 113 270 ref. M8 19 066 & Doduco (silver) 790 makes. Fits: Mobylette Cady, M1P, C1, M1PR, X1, M3 models. Mobylette/Raleigh, new contact sets, both Novi (gold) & Doducu (silver) makes—£8.50p per set. Contact point sets for Noris magsets ULZ-115/1Z, ULZ-185/1Z, Noris 355/356 (5430)—£15 per set. Bosch refs: 1.217.013.005 & 1.217.013.011 (type with pivot post fixed in mag backplate). Achilles Jlo, Zündapp 50cc; Bastert Jlo, Zündapp 50cc; Cyrus Victoria 38cc 1954-55; Eland Vicky 38cc 1953-54; Hercules Jlo, Zündapp 50cc 1953-55; Jlo 50cc 1953-55; Küchen 38cc 1953-55, Triumph (TWN) Knirps 47cc 1953-54. 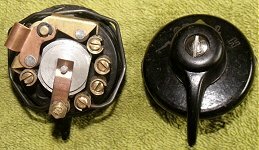 Rex/Victoria contact points/Schier Kontakte. £15 per set. Fit: Rex Fm31, Victoria Fm38. Suzuki: Contact points D-54. £10 per set. Marked for: Suzuki GT750, GT550. Suzuki: Contact points D-74R/L. £10 per set. Suzuki: Contact points D-77. £8.50p per set. For: Early model Suzuki FZ50 Suzy, A50, AP50, TS50, GP100, GP125, TS125, FR50, FR70, FR80. Suzuki: Contact points D-81C. £10 per set. Suzuki: Contact points K-44. £10 per set. Marked for: Suzuki B100, B120, CT120, A90. FEW ref: 32240-07010 & 32240-07021. 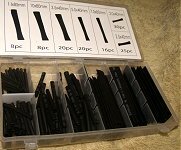 Wipac Bantamag contact points set—£20. Wipac Series-90 magset contact points set—£20. 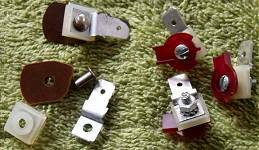 For all Wipac Series-90 magsets as fitted to lots of cyclemotors, mopeds, stationary engines, etc. Wipac S3908 contact points set—£20. 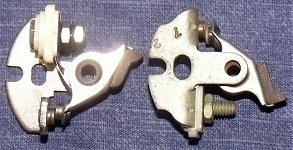 Fits BSA Bantam models D10–D14. Yamaha: Contact points H-21. £10 per set. Marked for: Yamaha YA5, YA6, H2, YA7, HS-1, AT90, YL-1E, YL-1D. Also DT100 & DT125. FEW ref: 136-81121-10 & 132-81221-10, Daiichi ref: 136-81121-10 (Available in both makes). Yamaha: Contact points H-50. £10 per set. 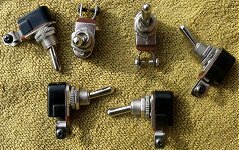 Marked for: Yamaha XS650, TX650, XS1, XS2. Magneto covers are listed on the ‘ChainMail’ page. Champion L82C copper-core 14mm short reach moped spark plug - £2.50p each. Recommended for Villiers 3K engine and suitable for most hot running 2-stroke moped motors, etc. Equivalent to old Champion specs L81/L5. 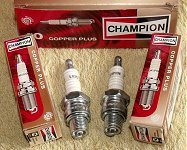 Champion L86C copper-core 14mm short reach moped spark plug - £2.50p each. Recommended for Villiers 1F, 2F, 4F, 6F engines etc and also suitable for most cool running 2-stroke mopeds, etc. Equivalent to old Champion specs L86/L7. Both L82C & L86C plug types are also suitable alternatives for Champion L10, L85, NGK B6HS & B7HS, Bosch W4AC, Bosch W175T, Lodge 2H, etc. Heat range note: higher number = ‘hotter plug’ to run in ‘colder engine’; lower number = ‘colder plug’ to run in ‘hotter engine’. 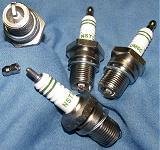 NST-UM6C 18mm spark plugs with 16mm reach—£5 each. Suited Villiers Junior DeLuxe, etc. HT lead with proper copper core conducter. Plug cap - non-resistive, £2 each. Headlamp: 4"/100mm lens, 5"/125mm case, c/w twin socket, chromed steel back. £25 each. Headlamp: 4½"/112mm lens, 5½"/137mm case, c/w twin socket fitted with 12V × 25/25W MPF bulb. Case, rim & reflector are moulded in Acrylic plastic with ‘chrome’ finish. Clear plastic lens. The ultimate cheapest complete headlamp unit offered - just £18 each. CEV moped headlamp, black. 110mm/4¼" between mountings. 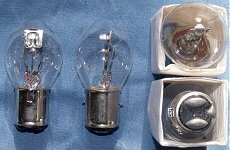 Sockets for P26S single filament main bulb & festoon pilot lamp. Removeable blank for 49mm diameter speedo casing. £20 each. 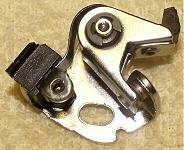 CEV IGM 3629PCX 111-R bracket mounting headlamp—£25. 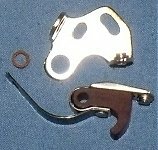 As fitted to Ariel 3 and other mopeds. Fitted P26s single-filament 6V × 15W headlamp bulb + festoon secondary socket. With white casing only. 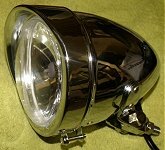 CEV pattern moped headlamp (unswitched)—£24. Socket for P26S single-filament headlamp bulb. Chrome finish top with ‘light-on’ indicator, black base. 115mm width between mounting points for headlamp brackets. Removeable blank for 48mm speedometer casing (eg VDO). 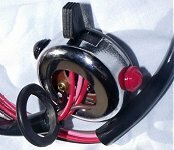 CEV pattern moped headlamp with on–off switch—£26. Socket for P26S single-filament headlamp bulb. All black finish. 115mm width between mounting points for headlamp brackets. Removeable blank for 48mm speedometer casing (eg VDO). FS1E pattern chrome headlamp: 4½"/112mm lens, 5½"/137mm case, c/w MPF twin socket + 6V×25/25W MPF bulb. Case & rim are chrome plated steel. Glass lens. £20 each. Luxor reflector Moby part no 20992. New - £15. For late type AV89/AV92/SP93 models, etc. C/w fitted top mount & socket core. Genuine NEW/old stock. 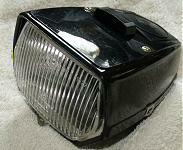 Niox moped headlamp (made in Austria, original Puch Maxi)—£20. 120mm between mounting centres. With fitted off–on lighting switch. 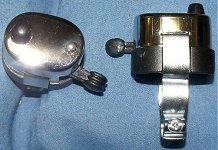 Removeable blanking plate in speedometer mounting socket. Type 45 headlamp. 5" diameter rim, 4" diameter glass lens. Chrome plated steel shell, 6½" deep on 10mm spot mounting bracket underneath. Dual filament headlamp socket c/w 12V×60/55W bulb. £40. Type 412 headlamp. 5" diameter rim, 4" diameter glass lens. Chrome plated steel shell, 4" deep on 10mm spot mounting bracket underneath. MPF dual filament headlamp socket c/w 12V×35/35W bulb. Capless wedge 12V×3W pilot (amber). Beam indicator (blue) 12V×3W. £32. Norman Headlamp Nacelle assembly (complete)—£85. Kit comprises: NEW fibreglass moulded nacelle housing, NEW headlamp rim/lens/reflector assembly (Honda C50) c/w 6V×15/15W MPF headlamp bulb and socket fittings (+ pilot bulb socket—not used), 2 × 5mm stainless steel screws to fit headlamp + 2 × anti-shake nylon washers. Please note: the moulding is finished in a plain gel-coat that will probably require painting to whatever topcoat colour is required to match the paint of whatever bike it is being fitted on. The gel coat is not a finished colour coat. VéloSoleX 3800, etc, original CEV204 headlamp glass lens c/w reflector - New, £18 each. Headlamp peak, chrome finish steel. Locates between rim & lens of headlamp. Sized 4½" diameter, but can be ‘tweaked’ down to suit 4" diameter, or up to 5". £6 each. 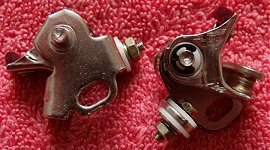 Fixes to all 120mm moped headlamp mountings. (CEV, Niox, EB, etc.) Chrome plated finish. 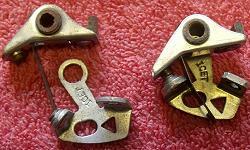 Headlamp clips, pack of 5 for £2. UK market lens with clear port to illuminate rear number plate. Fits Puch Maxi, Batavus GoGo, etc. 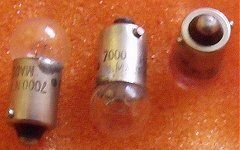 Piaggio/Vespa Ciao original F.B.Lux-2 RP-215 rear lamp lens - New—£12 each. 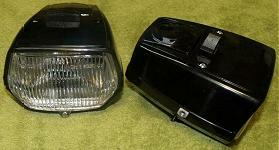 Puch pattern lens for original rear lamp unit—£10 each. Genuine UK market pattern. 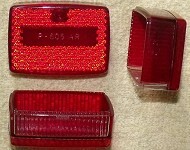 Red lens c/w clear port for illumination of rear number plate. (Continental market lenses were just plain red and do not comply UK market spec). Genuine Japanese made NEW/old stock. Fits: FR50, FR70, FR80 1974–87; APP50 1975–78; APP100 1974–80. Genuine Japanese made NEW/old stock. Fits: Early Yamahas 1970–74; FS1-E 1974–79. Genuine Japanese made NEW/old stock. Fits: SA50 Passola models 1980–86. 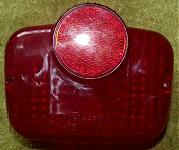 FB Ciclomotore rear lamp unit No.P-116—£20 each. Genuine original Italian made. Red lens c/w reflector. Mudguard mounting. Takes 30mm festoon bulb. 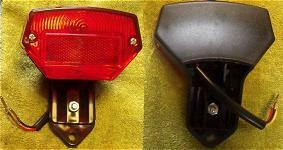 Old style Autocycle/Cyclemotor rear lamp unit—£22 each. Genuine original NEW/old stock. 1" diameter red lens. Body c/w clear port for illumination of rear number plate (the period cycle lamps did not have this feature). Bulb socket fitted with 4V × 0.3Amp bulb. 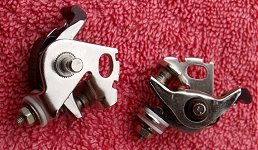 Rear Lamp, Lucas pattern MT110, 1¼" diameter lens, mounting 3 holes equi-spaced on 2" PCD, twin filament bayonet socket—£15. 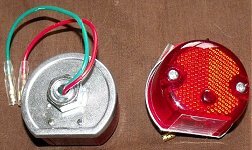 Rear Lamp, Lucas pattern type 679, as fitted to NVT Easy Rider models (and other British motor cycles)—£12. This unit comes standardly fitted with a BAY15D 12V × 23/8W bulb. Lucas Taillight Bracket in cast polished alloy for Lucas type rear lamp unit 679—£15 each. Can look pretty impressive when adapted to a moped! Radius generally suitable for mounting on 17" to 19" mudguards. (Example illustrated mounted on an 18" mudguard). 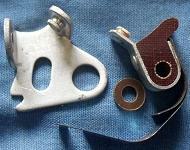 Adaptor plate kit for Lucas 679 lamp unit and cast alloy lamp bracket—£8. Kit consists of 1.5mm stainless steel sheet, with 2×stainless steel M5 low profile head fixing screws, + 2×taptite screws. The adaptor plate kit is required to assemble the lamp unit to the cast alloy bracket. 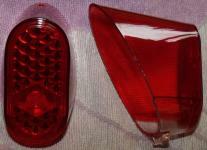 SIM 232.03 ULO pattern rear lamp unit—£20. with twin BA15S rear bulb sockets. Original manufacturer’s NEW/old stock. Fits Mobylette M50/51V models, etc. 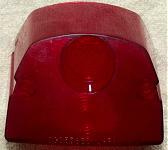 ULO 232.03 pattern rear lamp unit—£18. with twin BA15S rear bulb sockets, fitted with 12V/5W & 12V/10W bulbs + wiring. Wipac S446 pattern single-contact rear lamp—£12 each. Complete with fitted 6V × 10W BA15S bulb. 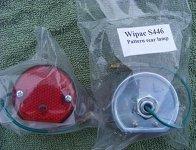 Wipac S446 Twin-contact rear lamp unit complete—£14 each. Note: twin contact socket with dual filament bulb for rear lamp and brake light function. Wipac S446 pattern rear lens—£3.50 each. 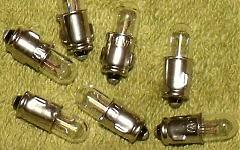 BA7S instrument lamp bulbs 6V×1.5W—50p each. BA9S 6V×1.5W. Small head, 9mm bayonet—50p each. BA9S 6V×1.8W. Small head, 9mm bayonet—50p each. BA9S 6V×3W. Small head, 9mm bayonet—50p each. Typically fitted into Puch taillamp, etc. BA9S 6.3V×0.25Amp (0.75W). Small head, 9mm bayonet. 5 pack for £1. BA15S 6V×3W. Small head, 15mm bayonet. £1 each. BA15S 6V×5W. Small head, 15mm bayonet. 50p each. BA15S 6V×8W. Small head, 15mm bayonet. 50p each. BA15S 6V×10W. Small head, 15mm bayonet. 50p each. BA15S 6V×15W. Small head, 15mm bayonet. £1 each. BA15S 6V×15W. Large head, 15mm bayonet. £1 each. BAX15D 6V×15W/15W beam/dip. Large head, 15mm bayonet. £2 each. BAX15D 6V×18W/18W beam/dip. Large head, 15mm bayonet. £2 each. BAX15D 6V×20W/20W beam/dip. Large head, 15mm bayonet. £3 each. BAX15D 6V×25W/25W beam/dip. Large head, 15mm bayonet. £3 each. 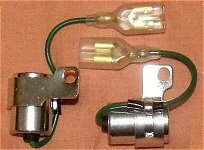 This is typical headlamp beam/dip bulb, with dual filament and offset bayonet pins (the bayonet pins are in line with each other, but are NOT of same length - one pin is longer than the other). BAY15D 6V×17W/5W stop/tail. Large head, 15mm bayonet. £2 each. BAY15D 6V×18W/5W stop/tail. Large head, 15mm bayonet. SOLD OUT. BAY15D 6V×21W/5W stop/tail. Large head, 15mm bayonet. SOLD OUT. This is typical stop/tail bulb, with dual filament and staggered bayonet pins (The bayonet pins are equal lengths, but NOT in line with each other). BA20D Bosch pattern dual-filament headlamp bulb, 20mm bayonet. 6V × 15/15W - £3 each. 6V × 20/20W - £4 each. 6V × 25/25W - £3 each. 6V × 35/35W - £3 each. 12V × 25/25W - £3 each. 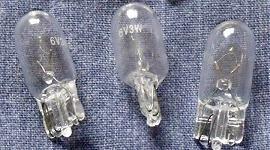 6V × 5W miniature festoon, 30mm long × 8mm diameter glass—50p each. 6V × 5W, 38mm long × 11mm diameter glass—£1 each. 6V × 15W, 44mm long × 14mm diameter glass—£1 each. Capless wedge (10mm diameter) 6V × 3W—50p each. Mini-capless wedge (5mm diameter) 6V × 1.2W—50p each. Florida No.353 6V × 18W/6W stop/tail. Large head, 15mm bayonet—£1 each. This is a very atypical stop/tail bulb, with dual filament and LEVEL bayonet pins of equal length! 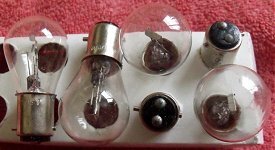 Because the bayonet pins are NOT staggered in the normal way of modern stop/tail bulbs, it would be possible to assemble this bulb in the socket either way round—but one pin is marked TOP to indicate correct assembly! This is obviously some real ‘old style’ bulb from bygone days of motoring, and must be installed in a correct and suitable socket. MPF bulbs (Mini Pre-Focus). 25mm flange with location pip. Twin filament hedalamp bulbs, beam/dip. P26S single-filament headlamp bulbs, 31mm stepped shoulder flange, typically for CEV lamps as fitted to Tomos A3, etc. 6V×15W—£2 each. Also, if you find the lights a bit dim, we can supply 6V×15W Quartz Halogen version at £4.50p each. SBC Small head, 15mm bayonet. 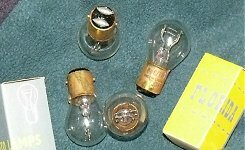 This is an obsolete tail bulb, with twin base contact but only single filament. We think it was used in some old Italian rear lamp sockets. 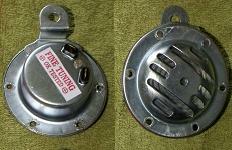 6V AC horn c/w mounting bracket—£10 each. For battery-less system mopeds, etc. Note: an AC (unrectified) electrical system requires an AC horn. A DC horn will NOT work on an AC system, and neither will an AC horn work on a DC system that has a battery. Electric Horn: 6V DC × 1.7A/10W (DC rating). Finish: black with stainless steel cover ring. £5 each. 6V voltage diode rectifier—£5 each. 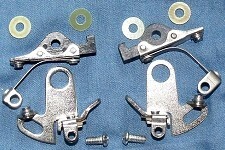 As fitted to Suzuki two-strokes (FZ50, FS50, X-1, etc) and can be used in universal applications. Raleigh RM9 / RM10, Special ‘Earthing Washer’—MMW395. New—£2. aka ‘Cupped washer, upper engine mounting bolt’. Fits on head end of cylinder head mounting bolt to earth the engine. Shrinkwrap sleeving: 127 pieces in 7 sizes in selection box—£9. Workshop solder reel—£15 per reel. ½lb/260g multicore-fluxed proper lead solder for cables and electrical. 60% tin & 40% lead alloy. Flux not required, it’s contained in the multicore.